The SDCC Star Wars Brickmaster Exclusive 2009 is a MINI set of a Republic Dropship and AT-TE. It was released on July 22, 2009 at the San Diego Comic-Con 2009. The set is sponsored by Brickmaster and only 500 of these sets are to be made. This set is similar to the Indiana Jones version released in 2008. The information about this set was first discovered in the July LEGO magazine. 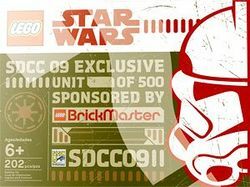 Facts about "SDCC Star Wars Brickmaster Exclusive 2009"